About 30 minutes ago one of my dogs went ballistic. This is not unusual. He barks like crazy for almost no reason at all. He had good reason this time. Two policemen were knocking on the front door. I walked from my office (which is remote from the house) towards the front door and shouted hello. They came to my back gate. "Are you Captain Ranty?" asks one. "What's this all about" I ask in return. "Well, our Chief Constable has asked us to ask you about Lioness Law", says he. "What do you need to know?" I ask. "Well, the chief thinks that you may be a victim of fraud, or a scam, and he wanted us to make sure you were okay". (At this point he shows me the Notice sent to the CC of Grampian Police by the Lioness. Handwritten is an instruction from the CC to make sure Captain Ranty is okay). "I am fine", I reply. "This is no fraud, no scam, I am not a victim". "Can you tell us more about it then? And, can we come inside?" "No, I'd rather do this here, it won't take long" says I.
I then proceeded to give them the low-down on Lioness Law, Lawful Rebellion, affidavits to the monarch, ECA 1972, treason, the Barons Committee of 2001, and a whole heap of other stuff discussed at this very blog. One copper got it straight away, and the other seemed reluctant to discuss it too deeply. He said that he wasn't meant to discuss politics at all. They both seemed genuinely fascinated. I got a bit iffy when they started to ask for my details and ended the conversation. They said they wanted my phone number in case the chief had more questions. I said I would be delighted to visit with the chief to enlighten him as well. They reckoned he may well ask me to do that. I showed them my Lioness Law card and explained that if they had come to arrest me I would have handed it to them, and that they were then meant to call their chief for instructions. 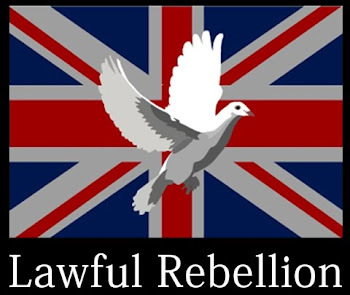 The word "rebellion" caused a bit of fuss but when I explained that it was peaceful, and lawful, they both relaxed a bit more. I said that violent rebellion didn't look too rosy for most of us, because "You", I said, "Have all the guns". Neither knew how many new "laws" had been passed last year, or this year. I asked them. They were stunned to hear how many had been passed. Neither knew that the crime of treason had been reported to over 80 police stations. Neither seemed to be aware that their (ultimate) boss had abdicated. Both saw the logic immediately though: if the queen is in error, then so are they, and the courts, and everyone who swore an oath to the monarch. Their authority is negated. I did explain that in the absence of authority they resort to force. "Which is easy, but it isn't right", I said. Both nodded. Both said that they would have a look around the various blogs and websites. I told them to search for Lawful Rebellion. EDIT: Watch this short clip. If you are in a hurry, fast forward to the 3:00 minute mark and listen carefully as a police constable admits that if consent is withdrawn, statutes cannot be enforced. PS-when leaving, one of the bobbies said "This was the most high-brow conversation I have had in a year! We usually deal with..erm..less articulate people. This is fascinating stuff, thank you for explaining it to us". I hope they doffed their caps before they left Ranty. They were very polite, very courteous and quite friendly. I think they were okay about it because I had done nothing "wrong". I do think (now) that they wanted a closer look at the old rebel. They will generate a report, they said. Maybe I was supposed to be doolally, or a fixated mental case. Could this be a turning point? Could those PCs boss actually realise that the game is up? If I get invited for tea and biscuits at headquarters in Aberdeen, I'll let you know. I'll take my CD (jammed with the evidence on treason) and hand it to the man. I've tried screaming, it doesn't seem to do much. I find it fascinating (and odd) that such a letter can get them fired up enough to make a house call. I got zero reaction from the queen, the Home Office or the prime minister when I sent affidavits to them. Maybe I should have started with the police? I just happened to mention all the other stuff to the boys in blue because they asked. You poor bugger, Cap'n. Chapeau. I have never felt richer. I am jammed to the gun-whales with good info. And the balls to use it! Beats the hell out of material wealth. If they can get away with killing people, and they have killed 1,463 since 1990, this should be a cake walk. "The girls were lying", the cops will claim. They still can't resist though can they? "We fear there may have been a fraud" which is obviously intended to ensure your co-operation from the get go. Here's my take on it - CC recieved a letter that frightened them, because they didn't understand it. Enquiries amongst colleagues produced variations on the theme of "Fucked if I know" So a couple of Plods were dispatched to your door to find out the lie of the land. Fair play to them for being polite and it seems like they may have learned something useful. I really really hope you get a chance for a sit down with the Chief and a few witnesses - you will, of course, charge handsomely for your advice and you may even get an opportunity to use the phrase "If you have nothing to hide, you have nothing to fear"
It wasn't me, it was the one armed man that did it. Lioness law is based on good legal arguement. I do not think the law wants to take it on. Capt'n, The problem me and my mate came up with when 'lioness law' was first brought to our attention by your blog was that surely there isn't a need for a letter to be sent to the police for every individual who signed up, why can't there be a letter sent to every constabulary informing them that anyone with a lioness law card has withdrawn their consent to be governed by statutes? Naming and sending a letter for each individual is not only time consuming but also it identifies people before they need to be and gives a heads up to all forces as to who are the "trouble" makers. I have no problem with standing up and being counted but there is also no need to put your head above the parapit before you have to. My way is more effecient and will have more people signing up..
Two people here in Yorkshire for a start. Not criticising just offering advice and asking a question. You are asking the wrong person. Why don't you ask the Lioness? She has a "contact me" page at her site. My head is already in full view so it wasn't an issue for me, but I do see your point. I think you may well be right. Let's see what happens. (If they are true to form, they will ignore it all. It's what they are best at). I have been a pain in the arse to their force in the past. I tore a strip off one of their chief inspectors, then I gave some of those visiting bobbies a bit of lip, so I shouldn't have been surprised that they sent two more to see me. I hadn't seen a bobby at my door for around twenty years. Since that speeding thing, I have seen nine of them. Always different, sometimes belligerent, and sometimes friendly. It would save some time. I wonder if the CC will let me record the conversation? That would be a hoot. Great stuff Cap'n; don't know if their interest was genuine or not, I wasn't there, but it sounds like you've given at least two of them food for thought. Who knows, it may catch on ? Any chance of them getting jittery about the word 'treason'? There are several names in the frame for that and most of them will be in one place on Friday, handy for arrests. There'll be plenty of martial back-up too, if they find they are getting any lack of coperation from those who conspired to make this a vassal country. It starts at the top but will they cascade the info to the beat coppers? They ALL ought to be terrified of that word. But it is far, far easier to carry out the Ostrich Plan. How fantastic would it be if there were mass arrests? I would rejoice if I even thought there was the faintest glimmer of a ghost of a chance this could happen. Sadly, they are all afflicted with Non Existent Spine Syndrome. It will be up to us proles to sort this out. Whatever happened to French scientists? Carbon dioxide is not a poison but the world’s best friend. David Bellamy. Ill Educated, Ill Informed And Polluting. Are you “The Debtor” or “The Creditor”? My Issue With The SNP. Who is Feeding the Media? "I blog, therefore I am..."
How Much, Mr EU? No Problem! Need A "Get Out Of Gaol Free" Card? Click here to get my waffle delivered!